Got #Mulleybucks? Get a 20% discount on a caricature! The Euro might be in trouble but Damien Mulley has been sending out gifts of his own currency to various people over the last month. 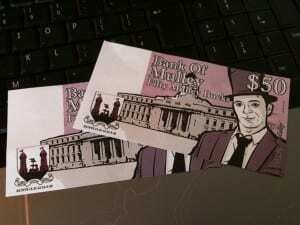 Mulleybucks can now be redeemed for special offers with various Irish companies, including Caricatures Ireland. I’m offering a 20% discount on caricatures on receipt of €50 Mulleybucks. So if you’ve been gifted your bucks and you’ve a friend with a significant birthday coming up, or friends got engaged, or your uncle is retiring, or your aunt made Lady Captain in the golf course and you want to get them a pressie, drop me a line! Damien’s sending out more Mulleybucks all the time, and more companies will be offering discounts with them in the next while. More details on discounts can be found on Damien’s blog. Retirement present for a Headmaster!